A guitarless band may seem strange at first, but the piano, bass and drums trio Ben Folds Five have dispelled any misgivings about their ability to rock as loud and hard as the next band. Calling themselves “punk rock for sissys,” the band have been grouped with the nerd rock movement of the mid-’90s with one exception, Folds knows how to write catchy and clever pop songs that hold up after repeated listens. The group’s story is, in many ways, the story of its de facto leader and namesake, Ben Folds. The son of a carpenter, Folds was born in Winston-Salem, North Carolina. Upon graduating high school in the mid-’80s, the young songwriter drifted from place to place in hopes of discovering a good scene to sow his brainchild. Throughout the decade when hair bands ruled the airwaves, Folds spent frustrating stints in Miami, Chapel Hill, New York and Europe before landing in Nashville in the early ’90s. To spite the fact that Nashville was a songwriter’s mecca, or because of it, Folds found the city’s approach to songwriting frustrating and exclusive. While producers and managers wanted obvious hits, Folds wanted, instead, to follow his own muse, a notoriously eccentric one at that. When Folds finally drifted back to Chapel Hill in 1994 he formed a piano-based trio with bassist Robert Sledge and drummer Darren Jessee and within weeks the band cut an indie single that attracted the attention of Caroline. Their 1995 self-titled debut sold strong enough to warrant the kind of major label bidding war that young bands fantasize about. Eventually signing with Sony, the group released Whatever and Ever Amen and continued the strenuous touring schedule that the band had become known for. 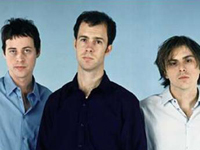 Releasing the singles “Battle of Who Could Care Less” and “Brick” into a climate awash with sound-alike guitar bands, Ben Folds Five and their witty, off-beat piano-based music were a welcome difference and the group became critical and commercial darlings.